Time for another report from beautiful Tangier Sound. I fished Saturday, along with the past three days with mixed results. 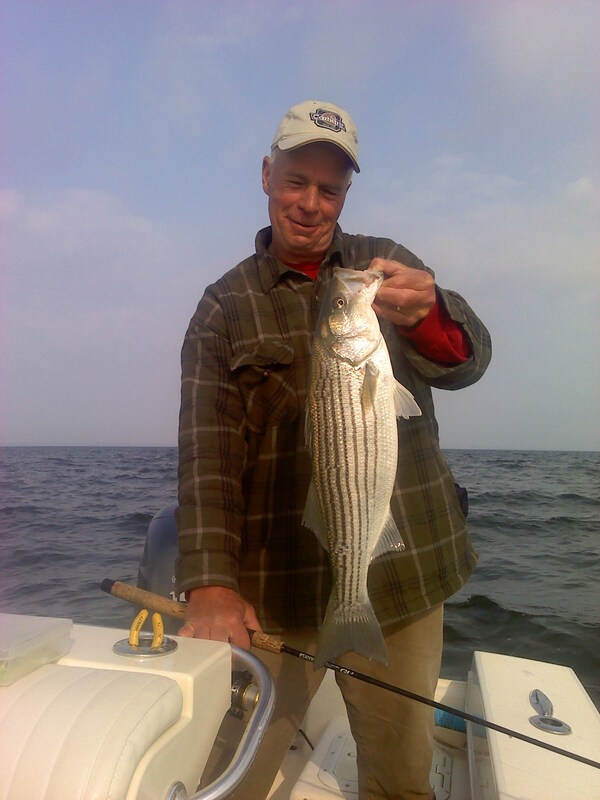 Monday was a picture perfect skinny water rockfish day, with overcast conditions all morning. 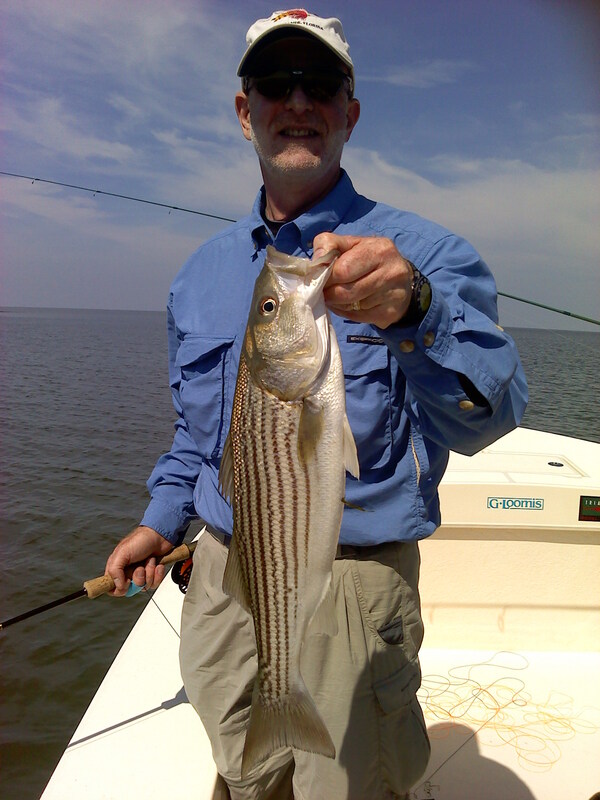 The fish didn’t disappoint, as we had terrific striper action in four feet of water on poppers, light spinning and fly tackle. Plenty of rockfish from two to six pounds came in the boat, and one BIG fish was hooked, briefly showed itself, and promptly released itself before we could get an accurate estimate of size. Let’s just say it brought back memories of the blowups that you see fishing topwater on the Susquehanna Flats. All-in-all, it was a great morning, and we left them biting to stop in Tylerton, Smith Island at Drum Point Market for a crab cake sandwich. 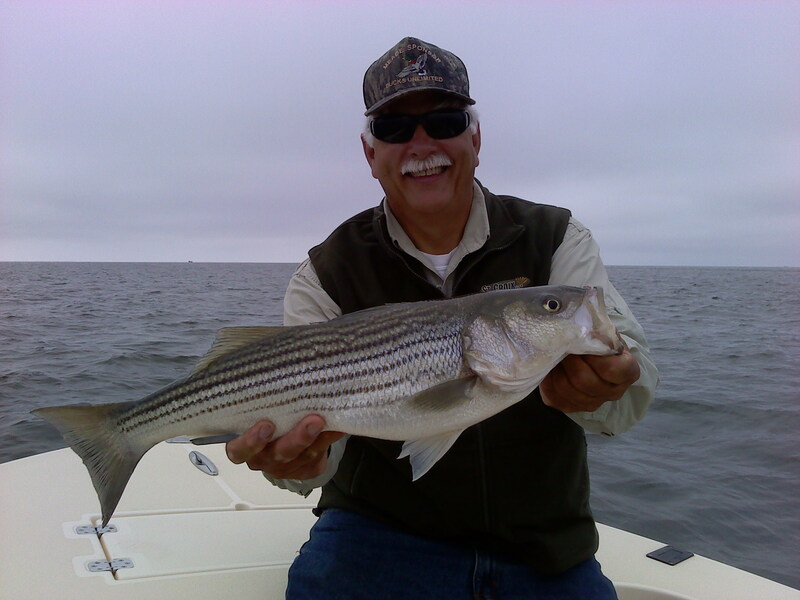 Pictured to the right is Gene Jones with a Monday morning rockfish. We tried a few places after lunch, but the tide had slacked and so did the fishing. To the left is Maurice Klein with a nice fish caught on a Stillwater Smack-it! popper. Gene with the day’s first fly caught rock on a 7 wt. Tuesday brought bright sunshine and slow fishing. 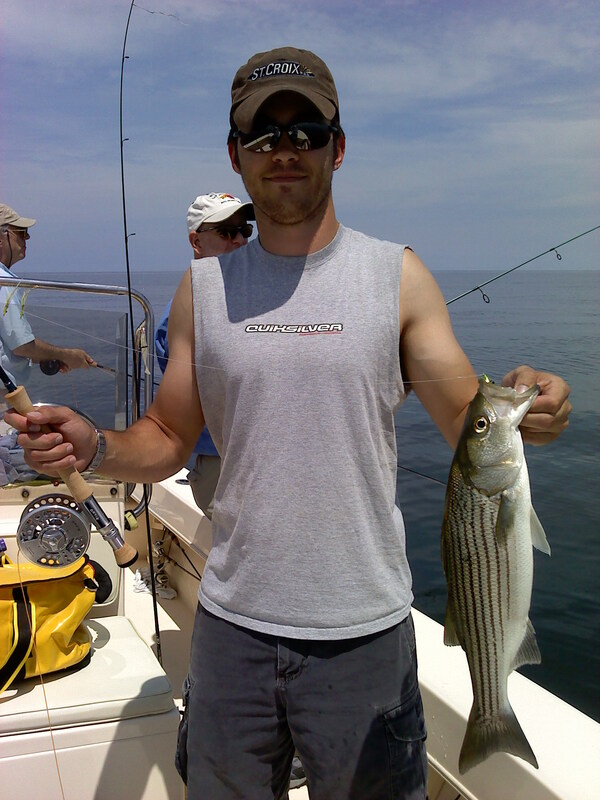 Since the specks have decided to avoid my boat it has pretty much been all rockfish, and the shallow water kind don’t much like the sun in their eyes. 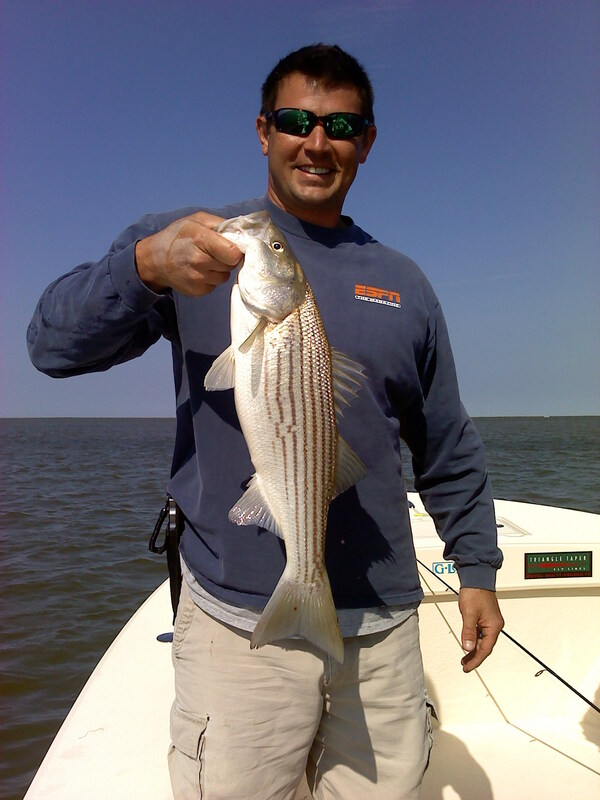 We traveled to the deeper waters of the bay proper for awhile and caught a few there, but nothing to write home about. Another crab cake lunch – this time at Ruke’s in Ewell – and then we decided to take a brief jaunt to Holland Island. 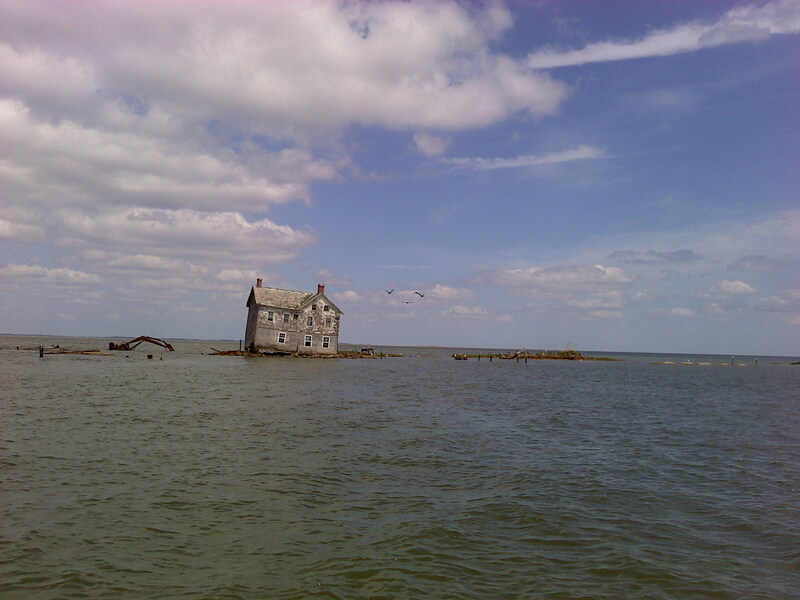 I don’t think this house was affected by the real estate collapse. Not a fish at Holland as the cow nose rays had made a complete mess of the flats. Dirty water as far as the eye could see. Still a great day on the water. Wednesday dawned with a plan to avoid the rays. We managed pretty well and caught enough blues and rock to make a good day of it. 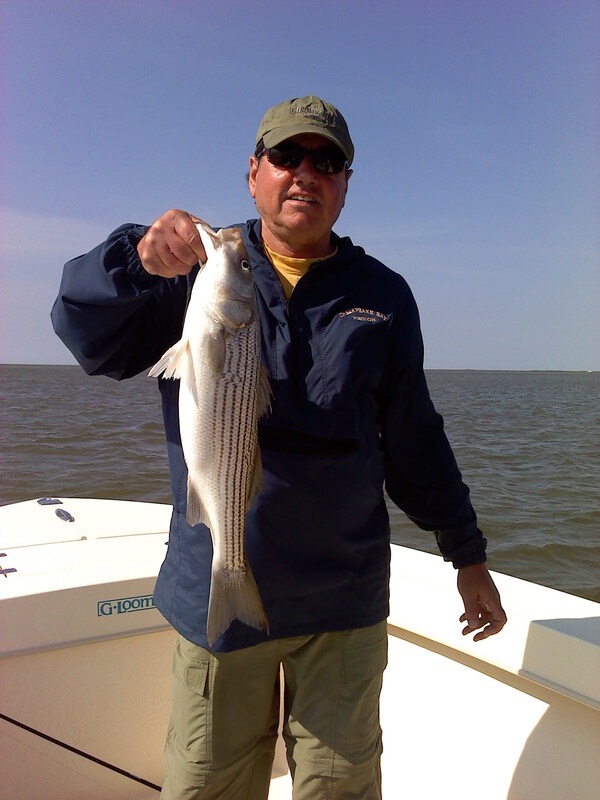 Not the bigger fish of Monday, but a pleasant day on the bay with enough action so you had to pay attention. Should see the bluefish action increase any day and most are expected to be in the 2 – 4 pound range. Looks like the shallow water striper bite is shaping up to be a dawn or dusk proposition – at least for the bigger fish. Maybe I need to start setting the alarm a bit earlier. Barry Portnoy fooled the fish on the right. Matt Roach had the hot fly on Wednesday – a yellow/white clouser. Bay water is warming! From the Little Choptank to Tangier Sound we consistently found surface water temperatures from 68 to 72 degrees. This is perfect for the speckled trout that are starting to show in the Honga River and parts of Tangier Sound. I had three trips this week with mixed success, mainly weather dependant. The wind blew both Friday and Saturday, turning the shallows to a coffee latte’ color. The fish were there but not feeding heavily for reasons I’ll explain below. 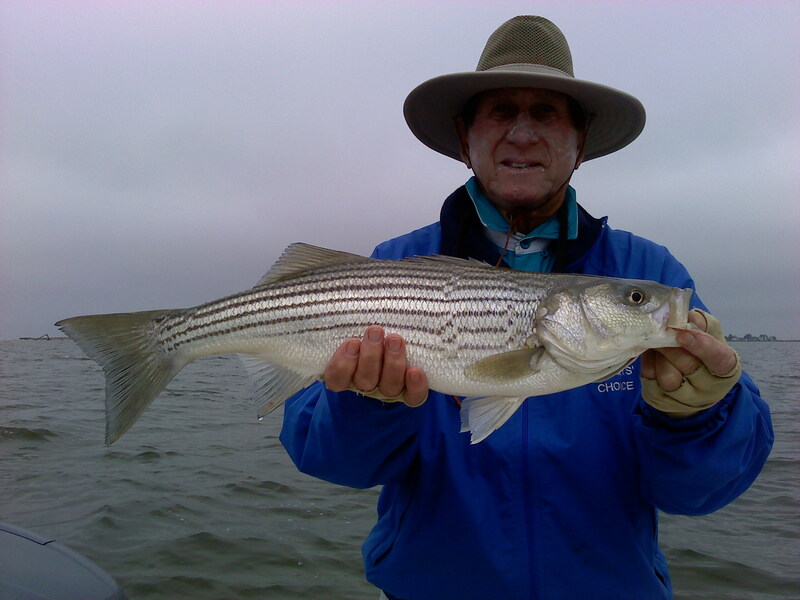 I fished out of the Little Choptank Wednesday with Joe Bruce of the former Fisherman’s Edge. 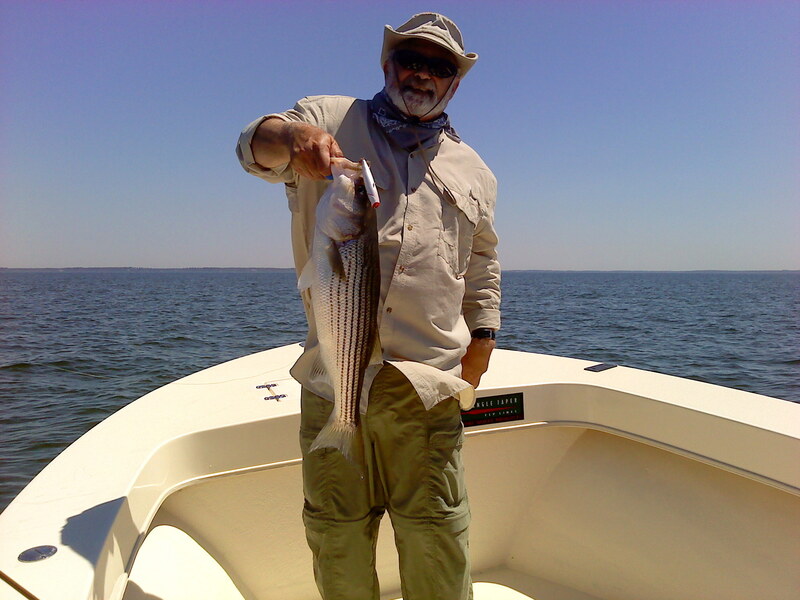 Always a great day on the water with Joe as his casting ability and quick wit reminds one of Lefty Kreh. 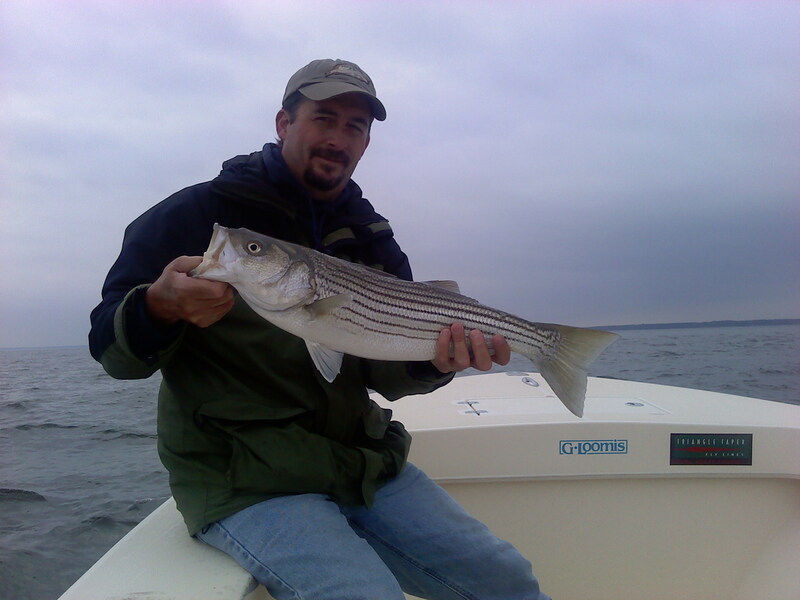 Caught 50 or so stripers from 14″ to 26″. All shallow water fly and spin fishing. Several were caught on topwater. There was lots of baitfish (silversides) in the shallows so the fish should stick around for awhile. The silversides could at times be seen taking to the air in an attempt to escape the marauding rockfish. Great fun to watch! 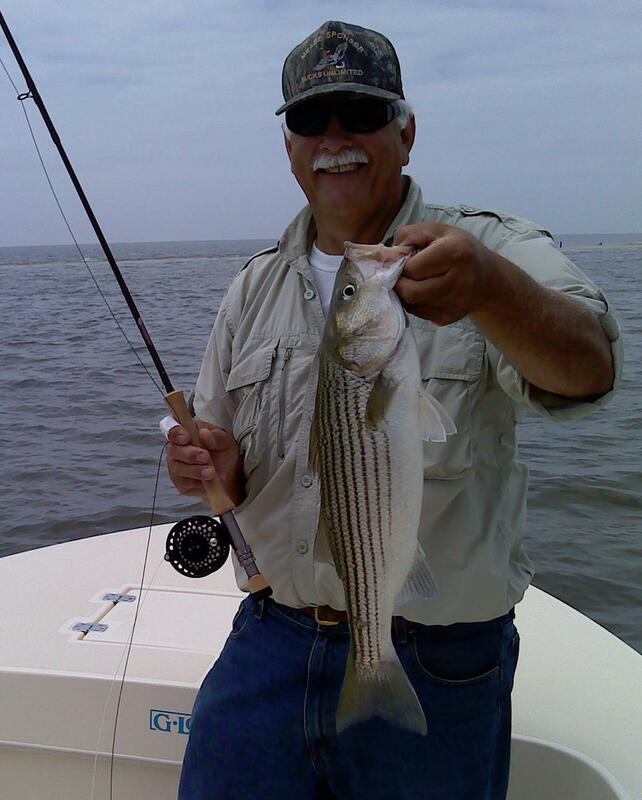 Here’s Joe with a 26″ striper that he caught on a Stillwater Smack-it popper. 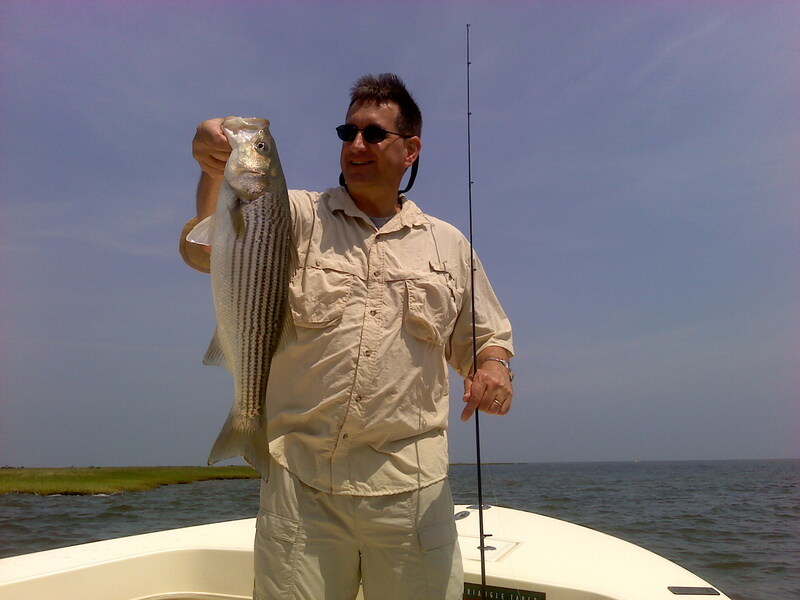 I had two trips to Tangier Sound towards the end of the week with somewhat limited success. Aside from the previously mentioned wind problems, the stripers that we caught were so full of what I suspected to be spawning clam worms, that their stomach’s were actually taut enough to beat as one would a drum. They were so stuffed, I honestly don’t know where they expected to put the four inch shads that they were trying to eat!? This clam worm swarm occurs once or twice every year about this time and can make fishing tough, as the stripers become so keyed in on the worms they want nothing else. Before you say it, I haven’t had much luck with worm patterns either. Anyway this should be over as I write this, and with the addition of post-spawn fish moving in, I expect the next two weeks to provide some outstanding shallow water action. Speckled trout are beginning to show as well, so I look to have a super report for you all next week.